Everyone with the correct answer will be put into a drawing for a little goodie, yet to be determined. 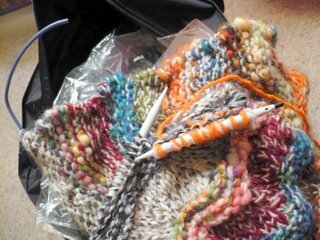 If you're a knitter, it will be a knitted thingamajig, if you're a crocheter, a crocheted one, if you sew, I'll make a felt doodad (probably a softie in each case, but don't hold me to that). Or, heck, maybe you don't do any of those things, who am I to judge? The winner (I'll have the girls choose a name Sunday night) can pick the way they want me to make their gift. Just something small, for fun, so postage won't cost an arm and a leg. If you want, you can click on the photo to see it in a larger size. I signed up for Thing-a-Day, so I figure I'll have plenty of opportunities to create something new. Are we supposed to email you or post our answer here? I'll email you. I had a similar thing happen and I was able to fix it. I have no idea, but it looks like a problem. Good luck with that! Hmmm...somewhere you lost your pattern? Maybe a k2tog or a ssk? Really I am stumped and trying to figure it out. Hahaha. Have a good day just the same! Where's the little wire bit that is meant to join tothe end of your needle? Or am I on totally the wrong track? Hey, you know I'm not a skilled knitter. For a little while, I thought you were using one needle and a biro to knit with. You blew out the end of your Denise needle. I HATE when that happens!